Mouth-watering empanadas de viento in the making! My aim with this article is to give you a short introduction to one of my favourite side dishes from Ecuador, the famous empanadas de viento also known as fried cheese turnovers. When it comes to suggesting which are some of the traditional dishes in Ecuador a tourist must-eat, I definitely include empanadas to the list. And, although empanadas are a traditional dish that you will find many countries in South America including Mexico, we have some special traditional empanadas in each country. You can find empanadas in most Latin American countries, from Mexico in the North to Argentina in the South. Empanadas are often times translated as stuffed turnovers or as hand-held pies. Empanadas are made with different kinds of doughs. As well as a wide range of fillings, which will vary depending on the local ingredients available. We eat empanadas in different ocassions and enjoy them as snacks, as a meal, if sweet then they are perfect as a party fare or dessert. Ecuadorian Empanadas de viento are stuffed turnovers filled with white cheese or queso fresco, that are then sealed and then the edges twirled to give it a nicer shape and prevent the cheese from coming out. At the end once they are fried and ready to serve, you sprinkle some sugar on top of the empanada. This is when this warm andthis cripsy cheese filled delight, is ready to eat! This picture, is from a party my parents attended to where you can see one of the main side dishes were emapanadas de viento. 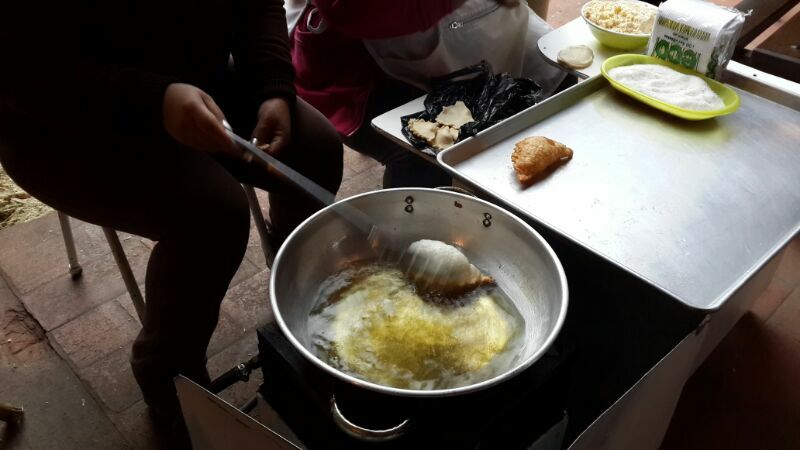 To celebrate 50 years of graduation from highschool they had prepared a full day with lots of activities, including some traditional food, like some warm empanadas. Empanadas come in all sizes and have different fillings. As you can see some are as big as a serving plate and just one can feed a Norwegian and 4 Ecuadorians! Empanadas de viento are quite popular in Quito. You can order them at restaurants offering traditional food in the highland region of Ecuador. In addition, there are street vendors selling them. If you visit the Coastal region and other places you will find other kinds of empanadas. So, if you are looking forward to tasting some of the gastronomy of Ecuador and the Andes, empanadas de viento should be part of your list. Do you have any other dishes you love from Ecuador or South America? There is also the homemade version that you can try to make at home! You can make your own empanadas for dinner, dessert or snacks. This book Empanadas: The Hand-Held Pies of Latin America is a fairly complete, well written how-to guide for making your own delicious empanadas, including gluten-free and vegetarian options!